I just stumbled upon this blog from another writermama blog. Inspiring. This will be me this year. A belated Merry Christmas and an early Happy New Year to my readers. Christmas was . . . tranquil. There was only a splash of drama. Overall, I realized how much I love being home. I found myself wishing for more time to sit on the couch and stare at the twinkle lights on my tree. We got our stockings embroidered this year, and I only had a week to admire them before the holidays. I saw a few of my favorite holiday movies (White Christmas, The Holiday, Family Man, Miracle on 34th Street, and the good part of Home Alone), but I still have many titles I want to see. We spent time with family, but all of the festivities went so fast. And the time celebrating with friends went doubly fast. I am not complaining. I am realizing how much I love the quality time that comes with the holidays. And I have decided I will keep my Christmas decorations up longer than usual. I just can't say goodbye to the twinkle lights and Christmas stockings yet. On a completely unrelated side note: I've been thinking a lot about my new year resolutions, and I am really excited about 2009. I can't wait for the year to start and my life to start on a new path--focused on a new goal. Bring on the next 4 day weekend, and all the fun that starts after! As I've mentioned before, this Christmas has turned into a storm of to-do lists and busy-ness and not a lot of fun, festivity, and focus on the real Reason for the season. Next year we plan to do things differently, and I've been discussing with my hubby how we can make that happen. It all comes down to priorities. What are the priorities we are going to focus on so that Andie learns our perspective on the season? Some ideas bouncing around in my head now are to only give presents to family, and even scale back on that. Until I can keep things simple, I'm not going to drown myself in the deluge of what to buy, only to be stressed at the end that I didn't get the perfect presents for my friends and even missed some people I love dearly. I may donate/volunteer in their honor. I used to scoff at this idea, but I see the value in it now. I'd like to create an advent calendar that suggests something to give each day--give a smile, give a plate of cookies, give your time, give a friend a call, etc. I've read many testimonies of people who give their time at local soup kitchens and retirement homes. Perhaps we'll look into those options next year. I heart traditions. I have quite the list for the Christmas season. Perhaps I should scale back on this too. If it again turns into a to-do list for mama, where's the fun in that? The focus should be on quality time with family and friends. Your thoughts? Your ideas? Your traditions? I think I might just talk about traditions later. We'll see! I realized later that I left another resolution off--Blog 3x's a week. Also, I was looking at another blog and a "writermama" plans to only query 3x's a month. I'm beginning to wonder if my goal is realistic. We shall see. Anyone have insight on this? As promised on my facebook, here are some of my 2009 resolutions and strategies to make them happen. I've always been a believer in not only writing goals, but writing HOW I'm going to accomplish them. 2008 has been a big year of, excuse the now-cliche phrase, change. Becoming as some bloggers term themselves, a "writermama" has been more difficult than I expected. It started with everyone telling me to "nap when she naps" and "give yourself time to adjust," and it continued with justifications to put all of my writer career pretty much on the back burner while I figured out this whole mama thing. Well, now that we've established a semi-routine, and now that the proverbial fire is once again lit underneath me, here are my goals for the new year concerning my writing/editing career. 1. Write 30 minutes a day, five days a week. The one thing that has had the most influence on my writing career and actually getting it started is what I learned from Peggy Fielding in a free class she offers locally, "You're not a writer unless you write." Simple. Profound. Rocked my world. I must be a writer. 2. Submit a query to a magazine/publisher/agent 3x's a week. Mainly magazine. Am actually planning on applying at a local magazine, and I'm on the hunt for community-based writing jobs. Of all I've read, the people making the big bucks started local. I wanted to skip local and go straight to national and then universal! But, it turns out, the local community is not to be overlooked and many times provides steady assignments. 3. Read 1-2 books per month. I know, that's not a lofty goal for a writer, but I must read. I read slowly, so this is a realistic goal. If I made it more, I wouldn't accomplish it. Granted, this goal's focus is on novels. Picture books I will read ad nauseum (is that spelled right?) with my baby girl. 4. Go to a major national writer's conference this year, fully paid for with my business money. When I go, I want to have at least 3 manuscripts and 5 agents that I've researched and am ready to pitch to. The resolutions continue to include health resolutions and spiritual, but we'll stop here. Now, the plan of attack. I find that I get the most accomplished first thing in the morning. If I don't do it first thing, I generally don't get it done. With this in mind, I've also noticed of late that I have two "first thing in the morning" opportunities per day. My hubby works two jobs, bless him, so I can stay at home. I usually wake up to see him off to his first job, then spend 40 minutes lying awake in bed wanting to go back to sleep. Then I wake up again to get ready for the day. Why not take advantage of both wake-up times? So, for 2009, I will get up and do all writing during my first wake-up moment. Then I will either work through to my second, or I will snooze and wake up again an hour or more later. During that second wake-up time, I'll work on health and spiritual goals. That leaves the rest of the day to focus on my daughter, and maybe, just maybe, I'll try that "nap when she naps" theory. We'll see. Housework has to fit in somewhere. . . I borrowed this idea from a friend. Yes, borrowed, I will kindly give it back if she insists, wink. It turned out pretty good, if I do say so myself. I tried again with a different pillow and ended up with Christmas tress under a starry sky. Perhaps I'll post it later. The Christmas craziness is finally feeling like it's beginning to slow. I've been taking a hard look at our priorities/to do lists, and I think our Christmas next year will be very different. Before I post all my thoughts, dear friends, tell me about your holiday experience and what you might change for your family next year. This year I've taken to crafting, primarily because that's what most of my stay-at-home-mom friends are doing. It started as something cute to do, then turned into a money-saving option for upcoming Christmas gifts, and now has overtaken my living room couch with a number of projects looming over my To Do list. Suddenly the holidays have become a goal, not an event. Right now I'm not dreaming of present possibilities, wishing for a white Christmas, or simply sitting back and being thankful for all the fun, family, food and so many more things that the holidays promise. My goal is to get my presents bought/made and wrapped a week ago. And instead of joy, I feel stress. Stress? That's not what the holidays are about! Where did I go wrong? From this point forward, everything changes. 1. Presents are no longer items on my To Do list; they are opportunities to bless others. 2. The bottom line changes from how much to spend on each gift to how much love I can sincerely pour from my heart into each present. 3. If it's not perfect, it's perfect. I must keep reminding myself that perfection is not necessary or realistic. 4. I'm not setting any more dates that I have to get something done by; I do what I can, when I can, and most important, I live in the moment. 5. This is my daughter's first Christmas, and even though she may not remember it, I want it to be as memorable as possible. I refuse to get too old to remember the little things that made the holidays special and that I looked forward to each December first. Since we were out of town for Thanksgiving weekend, we haven't decorated yet. This weekend our holiday begins with cutting down our own tree. From there we break out the rubbermaid boxes and adorn the house in red and gold. And, as Christmas day approaches, we will consume ourselves with traditions such as making an ornament to commemorate the year and will continue with going to as many Christmas parties as possible and remembering the true Reason for the festivities. 2. This is me, 20 weeks pregnant, finding out if we were having a girl or a boy. Isaac and I had a gut feeling it was a boy (which of course meant it wasn't). The lady whizzed over my belly pointing out arms, legs, and head, and threw in, "It's a girl," and kept going. Isaac and I looked at each other with big eyes, and Isaac said quietly to the tech, "Um, could you check that again?" I smiled through tears. A girl. Wow. It felt so real right then, and I knew my life was about to change forever. 20 weeks later baby Andie was born. I love her so much. 3. Tag: (not sure how to tag on blogger, so I'll just put this in and hope that my followers read this) Amy, Matt, Kristin & Lisa. Tag, you're it! When I lived in Michigan, it was always clear when the seasons were changing. When it was changing to spring, the snow melted. When it was changing to summer, I didn't have to wear a coat outside anymore. When it changed to fall, the colors. . .oh the colors, and the harvest of fresh veggies and fruits. Apple cider. Yummm. And when it changed to winter, snow. Most people here in the south hate and despise snow. I get that, simply because snow here is awful. But real snow, Michigan snow, ahh, it's a something to treasure and behold. My good friend called the other day and mentioned that it is snowing in Michigan right now and "it is beautiful." I am jealous. We don't get distinct season changes in Oklahoma. This week the temperatures will range from 30's to possible 70's. Which season is that? 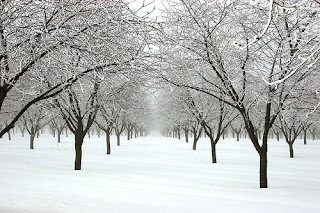 Here is snow in Michigan--oh, how I miss thee! And here is the only way I can tell the seasons are changing in Oklahoma. Sigh. Last night before going to sleep, my husband told me that his goal was to make me laugh everyday so that "there's always a smile in your eyes when I talk to you." I do need to smile more, stress less, and enjoy life. I have tried the whole breathe-deep-and-center-yourself throughout the day, but that just doesn't do it for me. It's a much bigger mental battle than that. I'm so thankful I have a soulmate to help me when breathing isn't enough. A quick review in pictures of my birthday and the fun that sharing it with election day added. From the top (the most recent post to here) 1) An exciting beginning to my birthday: Hubby surprised me with bringing home Chic-Fil-A for breakfast and a present to get the day started--new jeans! (not pictured, my friend Lisa met me at Starbucks for birthday coffee) 2 & 3) Baby girl and I met my mom and sister at Cheesecake Factory for birthday lunch and serenading 4) Birthday evening began with a line to the door for free Chic-Fil-A for an "I Voted"Sticker 5) Birthday Pic with Chic-Fil-A cow while we stood in line 6) Ahh, sweet free dinner. 7) Another present from hubby in between destinations--graphic tee! 8) In line again, this time for free Krispy Kreme donut 9 & 10) Yummy donuts (they were out of the patriotic star donuts, but the classic is always welcome 11) Another present--the completion of my ensemble, a super-fun jacket 12) A few quick exchanges at Forever 21 13) And a night cap of free coffee from Starbucks. Ahhh, let FREEdom reign. It's my birthday, and I don't feel a day over 30 ;-) No regrets, no over the hill, nothing black--just enjoying life. Wanna get me a present? Go out and vote. That'll be my gift. Then take a pix with your "I Voted" sticker and send it to me. What do you do with your very ripe bananas? Recently I've been stashing them in the freezer and using them as an ice substitute in smoothies. And, of course, there's always the compost pile. My mom always taught me to use the very ripe bananas for banana bread. Since my frozen banana stash is starting to resemble Mt. Fuji, I thought I'd try making banana bread. This recipe comes from Mark Bittman's How to Cook Everything--hands down my favorite and most used cookbook. The bread turned out delish! And, the best part, no more rotting bananas! 1. Preheat over to 350 degrees and grease 9 x 5 loaf pan. 2. Mix first 4 ingredients. 3. In a separate bowl cream the butter, eggs and bananas. 4. Stir the wet ingredients into the dry ingredients. 5. Gently stir the vanilla and coconut into the batter. Do not over mix. 6. Pour the batter into the pan. 7. Bake for 45-60 minutes until top is golden brown and toothpick comes out clean. I love the coconut in this! You can add a half cup of nuts too if you want. Last week my husband and I celebrated our anniversary. Throughout the day, I found myself saying, "Marriage is the best thing that has happened to me." Instantly I was checked, and thought That's so cliche. But, the more I thought about it, the less I thought that in today's world, that statement is not cliche. And that made me sad. In an effort to eliminate as many toxins and chemicals from my cleaning, I've found an easy way to keep my kitchen washrags and brushes clean. Each morning I add a little extra water to the teapot to brew my early cup. The leftover boiling water is dumped over rags and brushes to disinfect anything that may be threatening to grow. Easy. Clean. Green. I've recently discovered the joy of Amazon.com's wish lists. . .and the universal wish list button. I'm sure I'm way behind on this, but oh well. And on an editing note. . .I'm working on a couple of self-published titles. I definitely think there's a place for self-publishing (especially if you're an itinerant speaker and can sell them as you travel), but for the rest of you, what are your thoughts? Is it good that anyone can "write a book" and see their dream fulfilled? Writers are . . . The more research I do into the writing and freelance business, the more information I'm bombarded with. It's really incredible how much I can pull up on the computer that is applicable to what I need to know today and can use right away. I'm astounded that there can be such a wealth of information and still writers who send out random queries or manuscripts without an ounce of knowledge as to who their audience is and what they require. Having said all that, the more I research and listen to other writers, the more I see that there are no rules. Well, there are rules, but they're more like common sense things--find out a publisher's genres and submission guidelines before you query, don't just show up on an agent's doorstep with a manuscript--act like a professional, etc. But there are also rules out there that writing books tell you to follow that people break all the time and are still successful. For example, there is no perfect "process" to follow to writing a great novel--everyone has their own style. Also, queries should give the publisher/agent what they want, but you can break the format rules (renegade writer's blog says 1 page isn't necessary). I believe every writer has their own style and way of doing things because we're creators. If all creators were the same and were inspired the same way, we'd all come up with similar creations. The uniqueness of a project comes from the individuality of the creator. There's something we can glean from every writer, but for me, it seems that the most valuable "advice" I find is hearing things other writers do that affirm what I've already discovered for myself. Earlier I posted some comments from Louis Sachar. 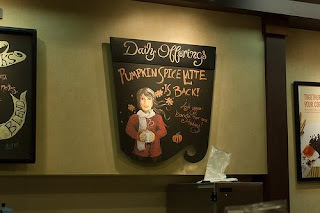 Here's some new things I learned at the SCBWI monthly meeting from published author Ally Carter. "Writing is like running an old hose. First the dead stuff and dirty water comes out. To get to the good water, you have to let it run. My first drafts are "dirty water" that I work on until the good stuff flows out." "Contests are good to gauge when you're ready for querying an agent." "My writing process is to start with the character and ask, 'What's the worst that could happen?'" "It's (publishing) a small business." --that's actually very comforting to me because I don't feel like I have to conquer the giant; I just have to get my foot in the door. "Don't get it right, get it written." --this isn't Ally's personal quote, she got it from somewhere else, but it's one of the mantras of my writing career right now. Uh, help desk, could you give me a hand with this? When we were going through pre-marital counseling, we were challenged to think of traditions we could establish for our own family. We've got a couple so far, and this weekend we started a new one! 1. Cut down our own Christmas tree at Christmas tree farm in Owasso. 2. Christmas morning wake up, do presents and stockings, then big pancake breakfast while we watch a classic Christmas DVD--so far Isaac has bought me a new one each Christmas! Apple picking and pumpkin patch! We just discovered a great family event--www.livesayorchards.com. Originally we went to pick apples, but we discovered so much more! There's a hayride that takes you to the orchard and pumpkin patch. They equip you with an apple picker (even being from Michigan, this was my first experience with one) so you can get the harder to reach apples because the school field trips have cleared the low ones. And they give you a half-bushel basket to fill with as many apples as you can balance. There were tons to choose from. This time we picked from the red delicious trees, but next year I want to get Granny Smiths so I can do more picking. A half-bushel is a lot more than it sounds like, so we'll be eating apples for breakfast (baked apples), lunch (sliced apples) and dinner (apple dumplings, pie and more!) for a long time! The pumpkin patch is huge! 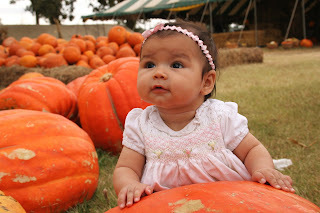 We didn't get a pumpkin this year since Andie's too small to care, but we will certainly be picking one out next year. We did get lots of pictures and came back all smiles. The farm also has a market which sells veggies and canned products. We loaded up on onions, tomatoes, Amish dill pickles, and sweet potatoes. I am so excited to eat everything. Next year we'll take the whole family--grandparents, cousins, aunts and uncles. Can't wait! The milk is gone, rice milk that is, so cereal is not an option. So, I took what I had and whipped up a yummy breakfast. Scrambled eggs with turkey lunch meat shredded into the mix. Then put it on a warm tortilla and added mont. jack cheese on top. Kept it on the stove til the cheese melted. Then topped it with salsa. Yummy and simple! I keep my castiron skillet/tortilla warmer always on my stove, that way it's always ready for use. Thanks Mom and Dad Abad for the must-have kitchen tool. Today marks my hubby's 29th year of existence, and I couldn't be happier that he was born. He completes me. He makes me a better person. My life is full of smiles, laughter and fun every day because of my husband. My baby girl is half-Isaac and that's the best gift anyone could give me. I truly believe if more people were like Isaac, the world would be a MUCH better place. I love you honey! Happy Birthday! My mantra since having a baby has been "It's so much easier than everyone says it is." And it has been. When babies are tiny, if you can wear them in a sling, you can do anything you used to. Your hands are free and your baby is asleep. I highly recommend a sling to anyone having a baby. It's so much more convenient than a stroller (with a stroller you have to take the elevator in the mall, find creative places to put grocery goods, etc. ), but it doesn't last forever. Andie is in the stage now (she's about 4 months) where she is too heavy for the sling, not strong enough to try the toddler position where she sits on my hip and holds herself up, and she's okay in a stroller (but, again, nowhere to put groceries). This turned into one of those moments-you-read-about-in-a-parents-magazine-that-makes-you-gasp-but-you're-convinced-would-never-happen-to-you. The other day I went to the chiropractor. My chiropractor's wife had been wanting to see Andie since I started frequenting their business when I was well into my third trimester. I brought her in in her carrier (even though I knew she didn't like long bouts in the carrier). 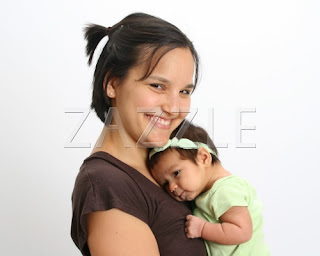 I asked the wife if she wanted to hold Andie while I did my thing. She was more than willing. That worked for all of 5 minutes, then the screaming started. I was getting a high-tech scan that required I strip the top half off and put on a smock while the tech ran a magic wand with rolling balls down my spine. The wife brought Andie to see me, but that didn't help. She bounced her, she walked her, she did everything possible, but the screaming continued. I couldn't take Andie because I had to sit very still for my magic wand test. Finally, the test ended, I threw my clothes back on (missing a sleeve--I later realized), and took my baby. She was so worked up, she couldn't quiet down immediately, so I was shushing, bouncing, etc., to little avail. Finally I asked for a quiet room to nurse and gave her a quick snack that settled her down. Then, back in the carrier, I skipped my therapy and went straight for the adjustment. She sat next to me so she could semi-see me, fussed a little, but made it through my adjustment. I think the chiropractor was regretting his previous encouragement to bring the baby with me so I could see him more often (my previous excuse for not coming multiple times a week). During checkout, she fussed and cried some more. Other patients started commenting, "Oh, that's the baby I heard." Earth swallow me now. I apologized over and again, and left as quickly as possible. Even in the car, it took me ages to get the seat clicked back in the base. Tears threatened as I realized I had become "that mom" and there was nothing I could do about it. I have a mama's girl. If you don't catch her at the perfect time, the only person she wants to be with is me. Do they grow out of this stage or do you have to break them of it? Anything is better than nothing. . .when it comes to my personal goal to write at least 15 minutes every day (even Saturdays and Sundays). Here are some of the highlights of what I learned at the SCWBI Oklahoma fall conference. Write precisely, especially for children. Life is in the details. When you're writing a novel, the rules don't change. Cut to the chase. Agents are eager for authors who can write novels and picture books. Don't underestimate their desire to search for books that make them think. Catch the reader in the first page. Don't open a book with 1)character looking into mirror and describing self 2)character waking up and thinking about life. Begin with action. June-August is a slow time with publishers. Submit books after September so your queries don't sit on their desk all summer and get lost in the shuffle. Keep tension in every sentence, especially with picture books. Search book titles/subjects/etc on Amazon to see how many people have already written your idea. The first few lines at the bottom of the first page of your manuscript are the editors' first impressions. Change emotions to non-standard parts of the body. Picture Storybooks don't need the illustrations to tell the story. They are generally wordier. Your writing has to be punchier and spicier because you're competing with TV. Publishers want adventure and humor. Picture books start with either the problem (what if. . .) or the character (who). This has to be established in the first two scenes. Story is when change is involved. An incident is when no change is involved. Write stories, not incidents. Major picture book mistake: too much adult in the story. Don't protect the characters; let them get in enough trouble. Picture books teach children how to cope with the world. Let the character do what you wouldn't. If your book makes you laugh, try to laugh harder. If it disgusts you, make it disgust you more. Today's successful books are character-driven. Cut down to action and dialogue (consider dialogue instead of narration). The adjectives, thoughts and emotions are for the illustrations. Keep them out of your story. No passive voice. Use action verbs. The beginning and end of a picture book are almost the same thing. 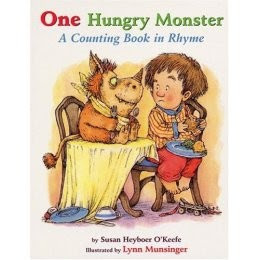 All picture books have both story and a universal truth. Saturday I went to the Oklahoma SCBWI fall conference. It was a one-day event in Chandler, OK. I'll post details of what I learned in upcoming blogs. Until then, let me just say, I was away from Andie for 10 hours--longest time so far, and I couldn't believe how much I missed her! She stayed home with Daddy, and he did an exceptional job taking care of her. I love both of them so much! I remember where I was when I heard about the Twin Towers being hit. . .in my apartment in Koriyama, Japan. It was about ten o'clock at night, and I was getting ready for bed. My other American apartment mate, Jeff, knocked frantically on my door, danced into my apartment, turned on the TV and repeated over and over, "look, look, look!" We both stood on the tatami staring at my 10 inch (or something ridiculously small) TV and watched the towers sending up billows of smoke. He had seen the second tower hit. It was like watching a movie, especially since I was so far away. I stayed up most of the night watching the coverage, hoping for some English to squeak through here and there, and checking the Internet for any piece of news I could find to put all the pieces together. I didn't get the day off like so many of my friends in America, so I got up early that morning and went to school. President Bush had said, "We're closing the borders," so I felt abandoned as I walked to the teachers' lounge and only a couple of people said anything about it. The day was in slow motion. Japan got over it in a week. It was like it never happened. I was floored when I flew into the States for Christmas and saw the "United We Stand" posters everywhere and news anchors still covering related topics. The best word I can use to describe it is surreal. Every morning around 7:30 AM, I hear my neighbor's car door slam and they drive away. When I lived in Japan, one of my apartment mates would leave around 7 and always kick his little sidekick into reverse and it made a squealing high pitched revving sound. I always thought, "Hmm, Ben must be headed out for work now." Do I make noises? Do my neighbors note my routines? What noises do you make? It always makes my day to read my hubby's blog and read something sweet he wrote about me. Isaac is a strong advocate of words of affirmation, and he frequently reminds me that he's in love with me and he thinks I am beautiful. My love language is quality time, so I don't do as well making sure I tell him how much I love him, so right now I am going to gush. . .
Isaac is my hero. He's the definition of self-sacrifice. Right now he's working three jobs so I can stay at home with our baby Andie. Not only does he work hard, but he tries to make sure that I'm living out my dreams. He doesn't want to ever hinder me from doing all that I can. He doesn't limit me, ever. At times I wonder, "Do other couples really have it this good? Is it possible that someone could be as in-love as we are?" I love being married. Next to my walk with Christ, deciding to marry Isaac is the best decision I have ever made. He makes me a better person. He completes me. I can't imagine life without him. They say "opposites attract." While one of our running lines is finding things we have in common and labeling them as "proof that we're soulmates," we are very opposite in many ways. One of the best ways is that I am way too serious and he is, well, for lack of a better word, a booger. Isaac always finds ways to make people smile. He's always cracking a joke. He can find the fun, or he can be the fun, in any situation. I truly desire that Andie takes this away from him. At times his humor has driven me crazy when I just wanted to be serious for a moment, but for the most part, it comes at exactly the right time and balances me out. I look forward to introducing him to other people. I'm proud of my husband. I know that when others meet him, they'll want to be his friend. He's not intimidating. He's down-to-earth and one of the most sincere guys I know. I love this man. And he loves me with all of my flaws. Wow. I really wonder, does anyone else have it this good? I hope so. I was in denial when people told me my life would change "drastically" after having a baby. My goal: retain social life, retain normality, don't drop off the planet and drown in raising children. I have successfully achieved that goal, but I have found a couple of glitches that can't be helped. Glitch 1: Date night. Yes, you can drop the baby off at grandma's so you and your hubby can still enjoy date night, but don't plan to be out too long. You can only neglect the need to feed for so long. Date nights still happen, but they are considerably shorter. Glitch 2: Dishes. Dishes get done, but usually not until the next morning. You eat dinner, you change baby into pj's and clean diaper, you feed baby, baby goes to sleep, you tuck in hubby, you're exhausted. Dishes are for mornings now. Other than that, for the most part, it's business as usual, and I love, love love mommyhood! My beautiful friend Hannah and I headed to the local library recently to listen to Louis Sachar address the young writers of Tulsa and present awards for the annual creative writing contest. His address focused on answering the questions most people ask him, the primary focus being, "What is your writing process?" Sachar clumsily worked through explaining his process which was about as unorganized as his speech. As Hannah said, "I enjoyed it. Once he got going, he was really good." The same follows for his writing process. Sachar spends an hour a day writing the first draft of his book. He admitted that many times it's discouraging because he's not even convinced he's written anything worthwhile for that day. But as time goes on, the story progresses, he follows rabbit trails that lead to nowhere, and he ultimately discovers the path the story is to take. He mentioned that this could take up to a year and a half before the first draft is complete. After that, he goes back through and spends a couple hours a day doing a second draft. Then a few hours a day on the third and fourth draft until everything's complete. His philosophy is to "keep it inside you until you're done" so that you don't lose any energy while writing it. He avoids critique groups and the like. The overall process takes about two years. As a former English teacher, my desire was for my students to follow a similar process in their writing. I wanted them to see the value of rewriting, and I wanted them to be as pleasantly surprised with their revised work as I so often am with mine. But alas, they are teenagers with busy schedules and hours upon hours to perfect a 2-stanza poem just doesn't fit into their common sense. I write because I have to. I rewrite because I would be cheating myself if I didn't uncover all of the hidden potential that I don't even see yet. Thank you, Louis Sachar, for sharing that message. Lots of people have asked for my guacamole recipe, so here it goes. Use a fork to stir all ingredients together. Yep, that's it. So good. So fresh. Always popular! When you sneeze, someone says, "Bless you" or "gesundheit." But when you hiccup, what should someone say? My baby has hiccups all the time. She even had them frequently in the womb. When she starts that cute little baby hic, I feel compelled to say something. But what should it be? Usually I just ask the question, "Do you have hiccups, baby girl?" I'm sure if she was old enough she'd call me out on my dumb question, but it's all I can come up with for now. Any suggestions? 1. Hold your breath--now that's just cruel to try and get a baby to do. 2. Drink water--I've tried nursing her and that works. 3. Put a tiny bit of sugar on the tip of her tongue--I'm probably being overprotective here, but the idea of getting my 3 month old addicted to sugar this early. . .I just can't do it. And "some" say that hiccups don't bother babies, they hurt the parents more. Not true. Andie gets really frustrated when her hiccups don't go away soon enough. Best advice I've ever received as a writer is simply this, "If you don't write everyday, you're not a writer." 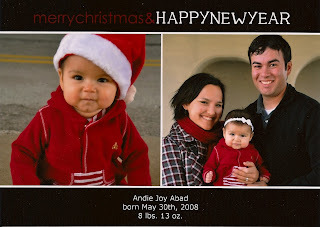 When I had Baby Andie, I put my "writer" title down and focused 100% on being a mom. Now that she's a little older and I can get up a little earlier, I'm back to writing everyday. Ladies and gentlemen, I'm proud to say that I am a writer. Much of what I've read and heard has encouraged that the more air my baby's booty is exposed to, the less likely she'll develop diaper rash. With an infant, this is a tricky task. One article I read suggested allowing baby to go diaper-less after a BM, so there wouldn't be anything big to clean up. I tried this yesterday. Cleaned up the BM, plopped baby girl down on a multi-purpose pad, and admired her cute booty waggling in the air. Later, went to nurse her while keeping her semi-swaddled in the pad. Baby girl had a bad case of gas, and as the nursing session went on, I was appalled at the lingering smell. It wasn't until all was done that I looked down to see that not only was baby girl passing gas, but she had managed to pee multiple times adding to the pool of poo that had run down her leg and was welling up at her feet. So much for that theory! The Revealers has a simple plot (middle school outcasts try to find their place in a stereotypical school run by cruel popular kids), yet I found myself longing to keep going back to the book and reluctantly putting it down when I had to do something else. As a high school English teacher, I try to communicate that effective conflict keeps the reader asking, "What happens next?" And while this plot seems to lean toward the side of predictability, I could not shake the need to know how it all turned out. The three main characters are all typical outcasts. Catalina is a minority. Doug is awkward. Elliot is a geek. The three are drawn to one another and find that they have a common goal, to no longer be the object of ridicule. Their solution is to broadcast their stories over the school's LAN. Soon they find that they're not the only ones with stories, and each edition of "The Revealer"that the send out empowers other students to share their stories while simultaneously deflating bullies' motivation to be cool by terrorizing others. Of course, with any situation where the kids take over and leave the adults out, there's an inherent edginess that keeps the conflict alive. 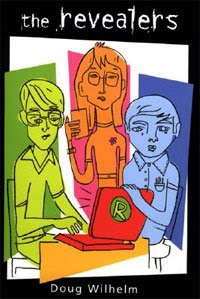 The book will quickly be dated because of the plot's reliance on a "new technology" where the students can communicate with each other via the local network. In an effort to keep the story realistic, the author has also included some explicit language and references to adult material. But for now, Wilhelm has provided readers with a controversial solution that empowers kids to not allow themselves to be the target of bullies' jeers and taunts. Tummy time. I had never heard the term before I had a baby. Ironically, I never even read about it during my pregnancy--and I read a lot, especially during those mysterious 2 AM I'm-wide-awake-for-no-apparent-reason bouts. But during those last moments in the hospital, before I was about to give up 24 hour room service and expert baby caregivers, my mom asked the question, "How much tummy time should she have each day?" I rolled my eyes, What is she talking about? I bet that's a term she used when she had us 30 years ago. But then I cringed when I heard the nurse say, "I'm glad you reminded me. Five minutes at a time, 3 times a day." One point for mom, zero for rookie. So, I came home and started baby Andie on tummy time. At first, I loved it and so did she. We spent most of tummy time with her curled up on my chest, and we would both quietly fall asleep into momma-oblivion. I loved those moments! Then, she got older (all of a couple of weeks) and sleeping on my chest was no longer her first love. tear. Tummy time became a daily ritual, something to be checked off the list of things to do for the day. And as I began routinely laying her down on a blanket, tummy-side down, she started crying, and crying, and screaming, and crying. "What did I do wrong?! How come my child doesn't like her tummy time?" We went to get professional pictures done with Andie's cousin. The photographer asked us to put both babies tummy-side down. I warned him that Andie doesn't enjoy that, but we tried anyway. I was right. There's a picture of the cousin happy and enjoying the bright lights, and there's my baby girl, faced scrunched, looking like her head weighs a bazillion pounds, and screaming. Cute picture, but I'd never by the admission of my errors as a parent. Why do all the photographers display babies who love tummy time, arms flexed tight, head held high and smiles on their faces? Why doesn't my baby look like that? Each baby ad screamed in my face, "You're doing it all wrong. This is how a baby should act during tummy time!" Finally I asked a friend if her one year old ever struggled. Angels sang hallelujah; her baby hated tummy time too! Then she listed off all of her other friends whose babies hated it. Ah ha! I am not alone! The next time I laid cute little Andie down, I patiently waited through the cries and even did some demonstrations for her of what to do. And, within the next couple of tries, Andie started lifting her head fully up. Victory! I cheered. I clapped. I danced around the baby and got my husband to join me. I'm not a bad momma! Andie-approved! My baby girl is nine weeks old, and she loves this book. She has sat through it twice now without crying. She looks at the pictures, and she talks back to me while I'm reading. I think it's the rhyme that she loves. Go figure, since I usually can't stand things that rhyme. But if my daughter likes it, then kudos to the author! 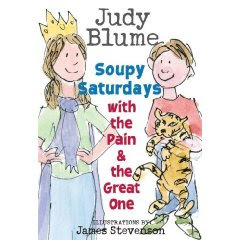 Sibling rivalry will never end, but Judy Blume has found a way to peek into the endearing moments that go unsaid between brothers and sisters. The Pain is the first grade brother, nicknamed by his sister for obvious reasons. The Great One is his third grade sister, also nicknamed for obvious reasons such as she wants to be a princess when she grows up, well, until her friend Emily asks her, then she's not sure. Throughout this illustrated novel, the Pain and the Great One fight and despise one another, but although they'll never admit it, they are encouraged by each other too. The point of view in this novel switches back and forth from the Pain to the Great One which keeps the reader on his toes and always surprised when one of the child's real names is used. While the narrative may be a bit advanced for a first and third grader, the actions and reasoning follows right along with reality. This would be a fun book to read aloud to your children, but I think most kids would rather read it quietly. Caution: If you are having your parents read this aloud to you, they may be tempted to say adult-ish things like, "See, honey, the Pain really does love his older sister, don't you think you should too?" So if you want to keep the fact that you really do love your brother and sister, then I suggest reading this one quietly to yourself. This book was recommended to me by a dear friend. 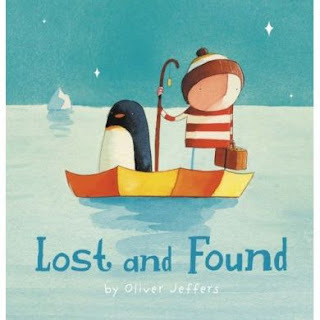 In the book a boy finds an unlikely friend--a penguin--but, like so many of us, he doesn't realize how valuable his friend is until he's gone. Their friendship is tried by "waves as big as mountains," yet the penguin proves himself to be a great listener and enduring friend. The boy believes he's doing a favor to the penguin taking him to where he belongs, but he learns that the true place he belongs is by his side. A simple and whimsical story with equally as poignant illustrations, this is a great addition to a child's library.